For the eighth straight year, an art and nature festival will be happening in the springtime in Fayetteville. Walton Arts Center this week announced their annual Artosphere Festival will return with a series of both free and paid events celebrating the natural world May 4-20, 2017. 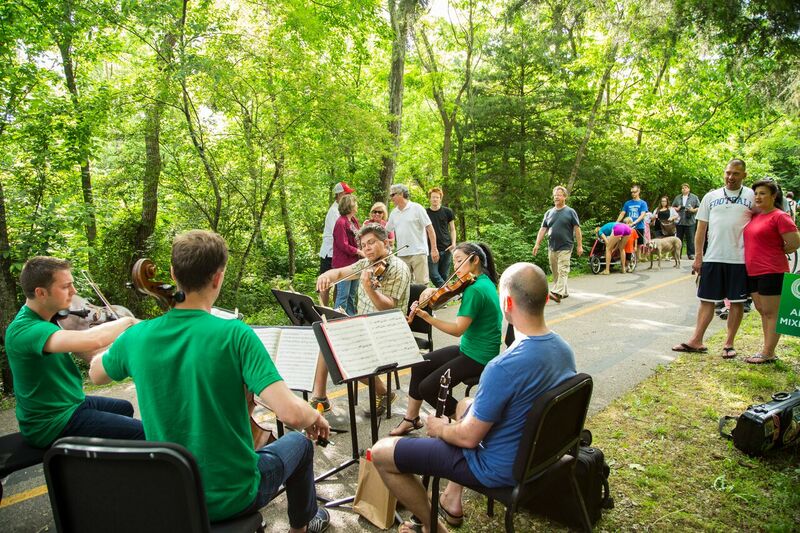 As usual, the festival will include dozens of events spread all over the region, including the popular Trail Mix Series featuring mini-concerts along the trail system, performances by the Artosphere Festival Orchestra, as well as several family-oriented performances. 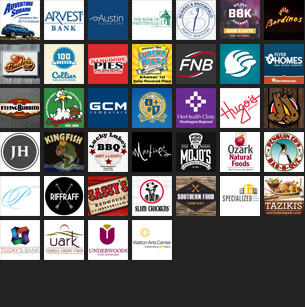 The festival’s popular Trail Mix events are set for the weekend of May 13-14 to correspond with the spring edition of the bi-annual Square to Square ride from Fayetteville to Bentonville. 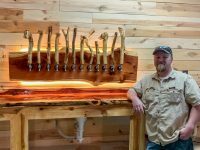 Trail Mix is a series of concerts and art experiences along the local multi-use trail system in the region, connected by the Razorback Greenway. 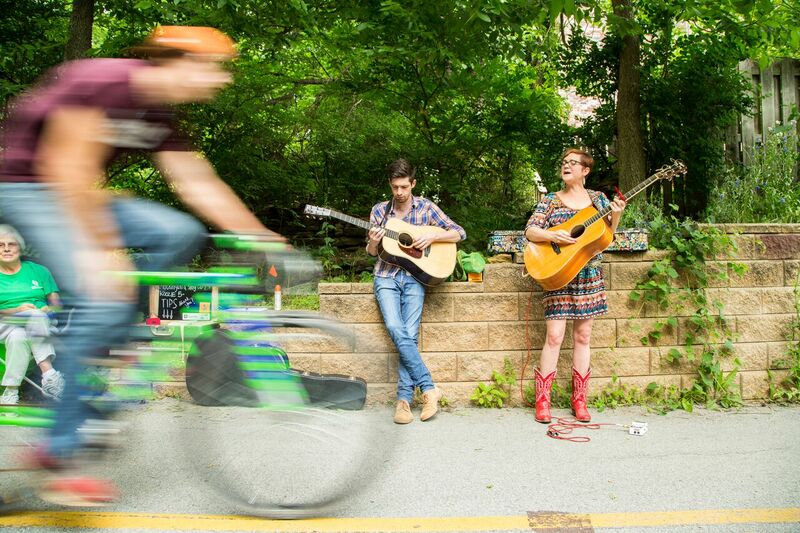 Trail mix performers this year include The Bike Zoo Giant Butterflies, Squonk, Chapel Music Series artists Claire Lynch and The Séamus Egan Project, along with local bands Rozenbridge, The Crumbs, Melody Pond, and The Sons of Otis Malone. The Artosphere Festival Orchestra, performing for its seventh year, is also always a highlight of the festival. 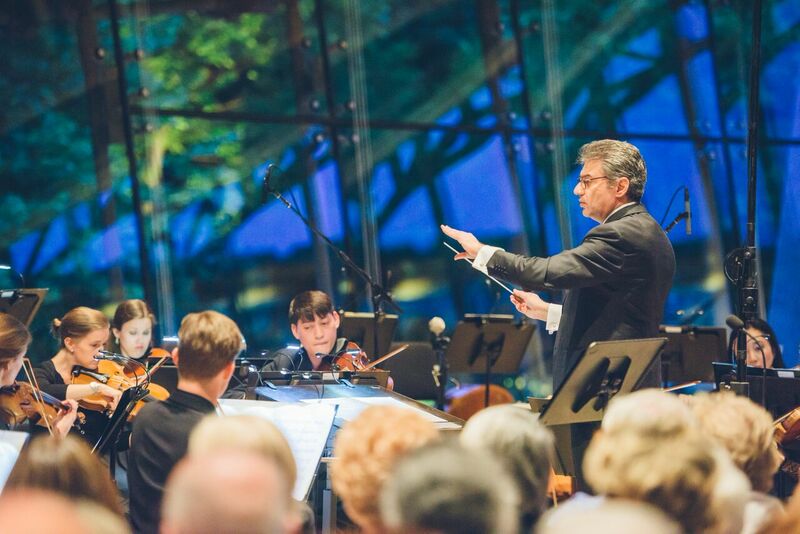 The orchestra is once again under the baton of acclaimed music director Corrado Rovaris, and will perform three concerts during the event; Live from Crystal Bridges: Mozart in the Museum on May 12, Mendelssohn in Scotland on May 17 at the Walton Arts Center, and the Artosphere Festival Finale concert on Saturday May 20 (also at the WAC). The orchestra will also be performing “pop up” concerts around the downtown/Dickson Street area on Thursday, May 18. In the Joy Pratt Markham Gallery, artist Diane Burko will exhibit her large-scale paintings and photographic series documenting glacial melt and other dramatic changes caused by climate change. The show will be on display beginning on Thursday, May 4. Several of the concerts and performances are low cost, or free to attend. A full list of announced performances, including specific show times and ticket information is below. For a bit more information, or to purchase tickets, visit waltonartscenter.com/artosphere. When: Saturday, May 13, 8 am to 3 pm. Trail Mix artists include The Bike Zoo Giant Butterflies, Squonk, Chapel Music Series artists Claire Lynch and The Séamus Egan Project, and local entertainers including guitar/cello duo Rozenbridge, bluegrass and folk trio The Crumbs, folk and jazz duo Melody Pond, acoustic country and bluegrass band The Sons of Otis Malone and more performing during both Saturday’s and Sunday’s events. Also during Saturday’s Trail Mix from noon to 4 pm, head over to the grounds of Crystal Bridges Museum of American Art for the 3rd Annual Garden Party. Artosphere Festival Orchestra musicians will present a series of site-specific, curated performances that will transform existing structures on the grounds into playable musical instruments. When: Sunday, May 14, 5 p.m. to 8 p.m.
More info: On Sunday, Trail Mix artists will be featured along the trails of Walker Park in Fayetteville starting at 5 pm. Then, beginning at 7 pm, get ready for the outdoor spectacle of Squonk Opera’s Cycle Sonic. These giant, animated human-powered stages that sprout bulb-horns, banners and whirligigs, will joyfully circle the audience, propelled by their own original chamber rock music. When: Friday, May 12, 8 p.m. When: Wednesday, May 17, 7 p.m.
More info: This opening AFO performance at Walton Arts Center will showcase Felix Mendelssohn’s Hebrides Overture and Symphony No. 3 “Scottish,” and Johannes Brahms’ Variations on a theme by Haydn. Tickets are $10, on sale now. When: Saturday, May 20, 8 p.m.
More info: This AFO finale concert will present Luciano Berio’s Quattro versioni originali della “Ritirata notturna di Madrid,” Antonin Dvo?ák’s Symphony No. 7, and Avner Dorman’s Frozen in Time featuring guest solo percussionist Malavika Godbole. Tickets are $10, on sale now. When: Tuesday, May 9, 7 p.m.
More info: Noted for their “exceptional interpretive maturity and tonal refinement,” the Dover Quartet returns to Northwest Arkansas to perform for a seventh season as founding principal musicians in the Artosphere Festival Orchestra. One of the most in-demand ensembles in the world and dubbed “the young American string quartet of the moment” by The New Yorker, the Dover Quartet will kick off this year’s Chapel Music Series with a special all-Beethoven performance in the stunning St. Paul’s chapel in Fayetteville. Tickets are $10, on sale now. More info: Artosphere welcomes Grammy® nominee and IBMA Female Vocalist of the Year Claire Lynch to Northwest Arkansas. Long at the forefront of women pushing bluegrass boundaries, Lynch’s soulful songs have been recorded by Patty Loveless, Kathy Mattea and others. Lynch’s stellar ensemble promises to deliver a comprehensive performance including tender country ballads, hard driving bluegrass, swing and even some Southern Appalachian clog dancing. Tickets are $10, on sale now. When: Saturday, May 13, 4 p.m.
More info: The internationally acclaimed Dover Quartet will present an afternoon of exquisite entertainment in the Great Hall of Crystal Bridges Museum of American Art. Promising to be one of the true highlights of the 2017 Artosphere Festival, this performance will feature a variety of classical music including the world premiere of Four Miniatures for String Quartet by Richard Danielpour, which was commissioned for the Dover Quartet by Walton Arts Center and Artosphere. This concert will be recorded live for delayed broadcast on KUAF 91.3 FM Public Radio. Tickets are $25, and go on sale Wednesday, March 22. When: Tuesday, May 16, 6:30 p.m.
More info: Experience the flavor of traditional Irish music by leading composer and interpreter Séamus Egan in the inspirational setting of Sassafras Springs’ old Chapel Ruins. A founding member of the seminal band Solas, Egan, along with his special musical guests, will delight with highlights from his immense and influential catalog of music as well as new music exploring the far reaches of Irish tradition. Tickets are $10, on sale now. When: Thursday, May 4, 7 p.m.
More info: Performed with vintage overhead projectors, shadow puppets, actors in silhouette and live music, Lula del Ray tells the story (almost entirely without dialogue) of an adolescent girl who lives with her mother in the middle of the desert. After a chance encounter over the radio, Lula becomes obsessed with a soulful country music duo and decides to run away from home. Inspired by the music of Hank Williams, Roy Orbison and Patsy Cline, Lula del Ray is a mythic reinvention of the classic coming-of-age story, exploring the themes of loneliness, femininity and the iconography of 1950s and ‘60s Americana through live cinematic shadow puppetry. Tickets are $10. When: Saturday, May 6, 11 a.m., 2 p.m., 4 p.m.
More info: Celebrated Italian children’s theater company Compagnia TPO has become known for their visual, emotional and immersive theater that crosses the border between art and play. In The Painted Garden, dancers, performers and the audience itself interact with four virtual landscapes each linked to a different color and inspired by painter Rebwar Saeed’s memories of his childhood in Kurdistan. The audience is led into a digitally created world of astonishing sounds and images, where every movement made alters the visual display as the gardens burst into bloom and life. This extraordinary performance will take children on a mesmerizing exploration of culture and space – discovering that their actions and dialogue create a response, which evolves into a shared artistic experience. Tickets are $10. When: Sunday, May 7, 7 p.m.
More info: Known internationally for presenting work of exceptional inventiveness and physical beauty for more than 20 years, MOMIX is a company of dancer-illusionists celebrated for its ability to conjure up a world of surrealistic images using creative props, costumes, lights, shadows and the human body. Inspired by the flora, fauna and simple magic of the American Southwest, this multimedia experience brings the Sonoran Desert to life, creating dynamic images of cactuses, slithering lizards and fire dancers. With visual splendor, wit and sheer physical daring, Opus Cactus will leave you breathless. Tickets are $15-$45. More info: When a boy discovers a single-propeller airplane in his closet, he does what any young adventurer would do: he flies into outer space. Millions of miles from Earth, the plane begins to sputter and quake. The fuel tank is empty, and the boy must execute a daring landing on the moon. But as it turns out, he is not alone up there. Tickets are $10. More info: This multi-sensory theatrical adaptation of Jean Giono’s environmental classic tells the inspiring story of a shepherd who plants a forest, acorn by acorn, transforming a barren wasteland. As much a touching tale as it is a hilarious puppet show, The Man Who Planted Trees shows us the difference one man (and his dog) can make to the world. Tickets are $10. More info: Internationally recognized artist Diane Burko creates large-scale paintings and photographic series that document glacial melt and other dramatic changes caused by global warming. Working in the intersection between science and art, Burko captures the beauty and grandeur of vast mountain landscapes and highlights some of the profound transformations taking place in our environment. When: Friday, May 19, 6 p.m.
More info: Grammy Award®-winning ensemble Third Coast Percussion returns to Northwest Arkansas to perform John Luther Adams’ expansive work Inuksuit. The title refers to the Stonehenge-like structures in the Arctic that the Inuit people used as markers to navigate their space. Inspired by the stones, Adams composed rhythmic layers within this massive, mobile community performance to represent the structures. Written for 9 to 99 musicians, Third Coast Percussion is currently recruiting community performers for this outdoor evening performance. When: Thursday, May 18, 7p.m. 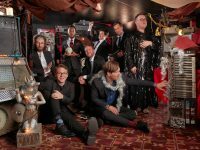 More info: Settle in or move around your favorite local pubs and other gathering places around Fayetteville’s downtown/Dickson entertainment district as Artosphere Festival Orchestra ensembles perform casual “pop-up concerts” for your listening pleasure. Download the Artosphere App for an up-to-date list of pop-up concerts.